Two of our recent trips to London, however, have seen us pay visits to The National Gallery on Trafalgar Square. The first of these was because my nine-year-old was doing a school project on the artist of her choice. She chose French artist Renoir. Which is fine, though why she couldn’t choose someone who has art displayed nearer to home I don’t know. I did try and guide her gently down the Henry Moore route, but it wasn’t to be. We were in London already for a special sleepover at the Science Museum, so we popped into the National Gallery to see if they had any Renoir. They did! We asked the helpful lady at one of the customer information desks and she sent us directly to Room 44 where there were indeed a couple of Renoir’s famous artworks. We got ourselves a couple of pics of us standing in front of them, mainly so we could print them out and stick them in the nine-year old’s project book for extra Brownie points. I can’t find the photos now but they did exist I promise. 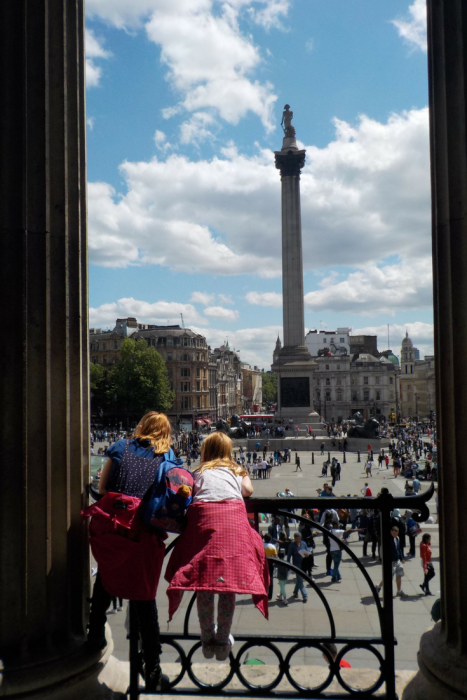 I do however have a lovely pic of us on the balcony of The National Gallery looking out over Trafalgar Square on a very hot and busy day. 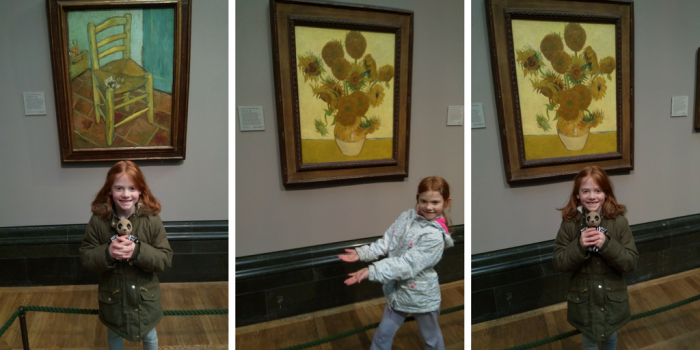 Our most recent trip saw us again at The National Gallery as the twins had a topic of Van Gogh coming up at school in the half-term after the February break. We decided to take the class toy Oleg and again have our pics taken so we could put something at least cultural in his holiday diary. Again we headed straight for the Van Gogh room (Room 43) rather than traipse round and round disturbing all the other patrons. It was very busy and we had to wait a couple of minutes for others to have their turn looking before we could get the photos. The twins did enjoy looking at the artwork and I know they have been telling their teacher all about seeing them for real when Van Gogh came up in lessons. 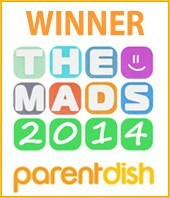 So is the National Gallery family-friendly? Yes, it is. There are loos a-plenty, baby changing facilities, disabled/pram access, and a cafe. The gift shop is also awesome with some fantastic stuff you can’t get elsewhere (and some breakables too, so take care!). It’s free of charge, so it doesn’t matter if you only want to pop in for an hour or even less. There are family-friendly tours available. Audio tours are an extra cost, or you can print yourself a trail sheet out before you go. 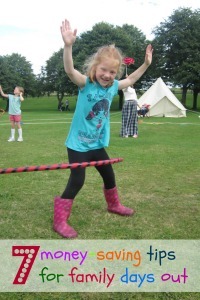 Have a look at https://www.nationalgallery.org.uk/visiting/printed-trails/visiting-with-children for more information. 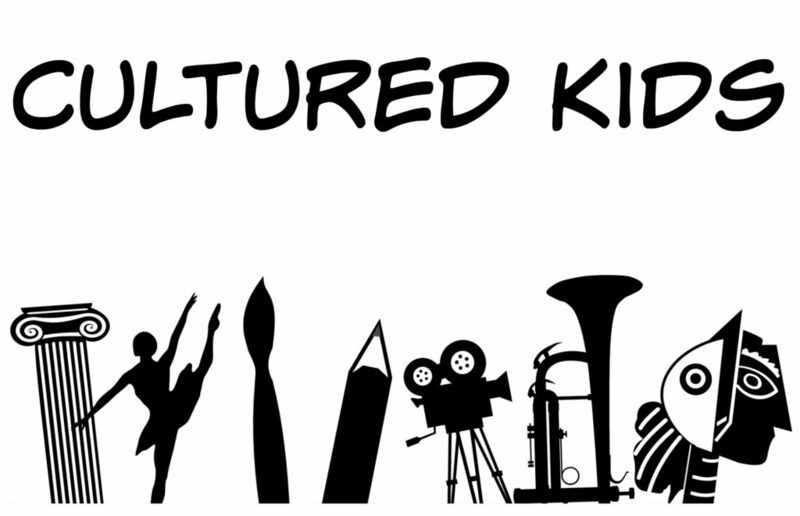 I think that the National Gallery is a fantastic resource on art education for children of all ages. Just try and steer them away from the nudes, eh? Yeah, I think mine are still a little way off the quiet thing! Your girls are staring at one of my favourite paintings by George Seurat! 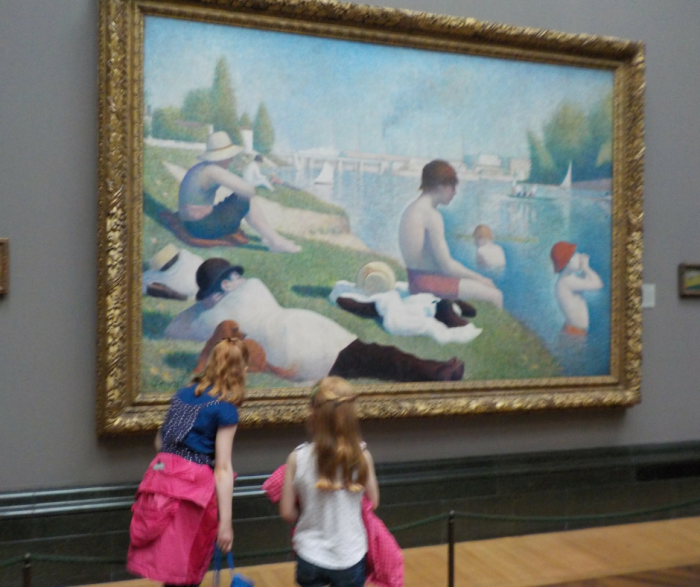 I agree, the National Gallery is a great space for kids as it’s so beautifully organised. We’re so lucky to have this on our doorstep, and for free! We love the National Gallery too and always head for the basement for a coffee! It’s a great place to pop in for a look at a certain artist – the great plus of it being free entry. We’ve always had great fun in art galleries with our boy – usually making up alternative names for paintings. He probably still does this now, aged 22! We are so going to do this on our next visit!